A male and female coordinate rolling of the ball. And that’s a hole with this poo ball I built. Just give me poo that I can shape and roll. Ok, that was taking a little liberty with a Bob Seeger tune but these little guys are truly fascinating. Sure, they roll balls of manure around but that's just their gig. That's how they live. 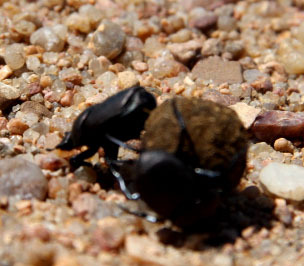 These dung beetles are in a family called Scarab Beetles. Their scientific name is Canthon pilularius. They relatively quickly find fresh dung (mostly cow dung in Kansas) and carve out a circular portion. Then they fashion it into a sphere which they will roll off for a distance of several feet and bury it for food. If they are a mated pair, the female helps, laying eggs with the buried ball. The eggs hatch and, walla, a free ball of fresh food is right there for the hatchlings. Yummy. In pastures, you can find abandoned balls of dried cow dunk resulting from abandonment by a frustrated male or for some other unknown reason. Look more closely for activity and you might be able to enjoy several minutes of dung beetle watching--it will be a natural show you will find very entertaining!